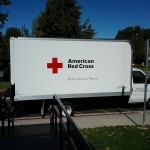 On November 10th, a local elementary school hosted their annual blood drive for The American Red Cross. Those interested could donate blood, be tested for a bone marrow match, or donate their hair. Several Cydcor team members jumped at the opportunity to help! They dedicated their time by checking in donors and assisting where needed. Team member Tara Cavallaro even donated her hair – 10 whole inches of it! “I was so glad to be able to help,” she says.